As Clevelanders, we are lucky to have a dedicated group of professionals here that work hard to build and promote a better food system. The Plum is one local business that is doing just that, and Chef Brett Sawyer is the driving force behind the mission. He opened The Plum with partner Jonah Oryszak in 2016, and his dedication to supporting local farms and reducing food waste is nothing short of impressive. Here’s the lowdown on Brett’s journey: He spent some time in college, both at Ohio State and the University of Akron, often not attending class (we’ve all been there) and working at restaurants in various front-of-the-house positions. He eventually moved to France, where, not surprisingly, he became more interested in cooking. After returning home from France, Brett was contemplating a career as a chef. He moved back to Akron and worked as a bartender at Chrissie Hynde’s former restaurant VegiTerranean, but ultimately Brett had his eyes set on the kitchen. Then low and behold, one day a line cook job opened up and he took it. From that moment on Brett’s love for cooking was solidified. As consumers and food lovers that are concerned about climate change, many of us make it a priority to support businesses that build their operation on sustainable practices. It’s our way of voting with our dollars, and it’s a crucial piece of the puzzle. But in the grand scheme of things, supporting those businesses is just one step in the process. Ultimately if we want to make an impact, we have to learn from their example and implement those practices at home by making it a part of our daily lives. We’re lucky to have chefs like Brett who show us that reducing food waste and supporting local farms is totally possible, and most importantly, that it’s not hard. Ok, enough preaching. Remember that new concept I mentioned…..Brett and the rest of the gang are set to open up a new spot in mid-January. The new Battery Park location is called Good Company and will be more of a modern, hip sports bar with a menu reflects the concept. Think burgers, fries, wings, potato skins, and all that but with plenty of vegan and vegetarian options too. 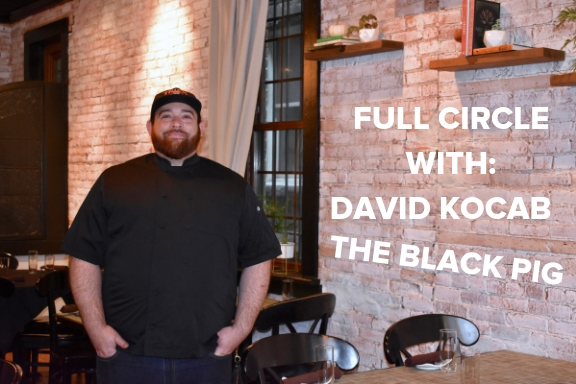 Over the years, educating people through food has become super important to David and he’s made it the cornerstone of his mission since he started as Head Chef at The Black Pig a little over a year ago. Those of us who are involved in food systems work recognize the need to create engaging conversations with consumers to help them understand the intricacies the food system and how it affects them. That is particularly true when it comes to food waste, which could possibly be the least understood part of the food system and is also an integral part of David’s mission.